As Warrington continues to expand its online program offerings, the latest innovation will provide those programs with an enhanced student experience. 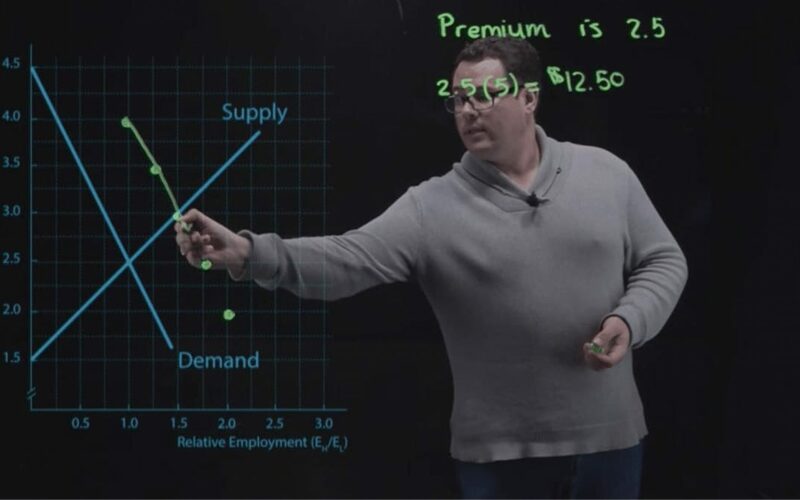 Warrington developed a new lightboard studio that is available for faculty lectures and provides students with a more personal experience while watching online lectures. Instead of staring at a faculty member’s back while writing on a chalkboard, this new lightboard gives faculty members the ability to make eye contact with the camera while writing and solving problems on a board. How is this possible? The key is a piece of glass and some innovative technology. Between the camera and the faculty member is a piece of glass that serves as the focus of the lecture. As the faculty member writes on the board, a digital box in the camera flips the image so the viewer can read it left-to-right on their screen. That happens without interruption and without eye contact being broken between the faculty member and the camera. The camera also gives a more intimate feeling for students. Instead of sticking a camera in the back of a large, in-person lecture hall, the viewer feels like they are the only person in the room. The lightboard can also show any business problems on the glass for students to see. This allows faculty members to fill in tables, draw graphs and make the online learning experience more enjoyable for the student. Chris Smith, Manager of Video Services at Warrington, was charged with leading the project from when construction was started in the summer of 2017. The lightboard required its own room, fully soundproof to avoid any outside noises from leaking into the recording.